Servicing greater Houston and adjacent counties of Galveston, Chambers, Brazoria, Fort Bend, Harris, Liberty, Montgomery and Waller for commercial appliance repair. Conveniently located at 3428 Yale Street, Houston TX 77018, just off Interstates 45 and 610, General Parts Group of Houston is your go to for foodservice equipment repair and maintenance. 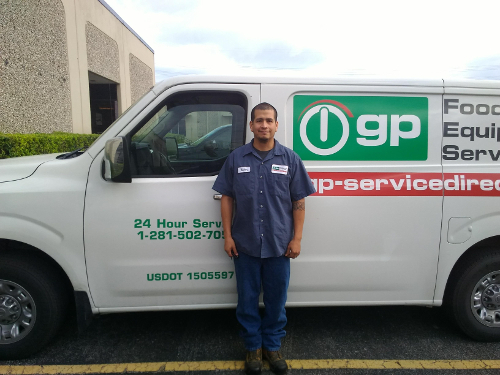 For further information don’t hesitate to give us a call at 218-502-7053 or email at HoustonDispatch@GP-ServiceDirect.com. We are here help! 24/7/365 Availability – Your food equipment service will not be needed for long, even if something breaks on a holiday. Our dependable technicians give you peace of mind all year round. Versatile Repair – Our factory-trained and industry-certified technicians are ready to handle a variety of equipment including: ware washing, refrigeration units, HVACs, commercial cooking and food preparation equipment. For small appliances, we can receive those at our office and repair them in our shop. Book your service now. Progress Report – If you like, we can keep you updated on our progress during our service calls. Our Automatic Status Update System enables us to send you emails throughout the service so you always know what’s happening in your kitchen. Customized Service Plan – Routine maintenance keeps your kitchen both functional and reliable. It also extends the life of your equipment. We have a knack for developing unique maintenance plans to fit the individual needs of your commercial kitchen, whether it is for commercial oven or restaurant equipment repairs and preventative maintenance. Flexible Installation – Our commercial appliance repair technicians are qualified to install most brands of commercial kitchen appliances. We offer flexible scheduling to complete your service without interrupting your daily business. We install on your time, not ours. Quality Parts – Our certified repair technicians use O.E.M. parts from our vast inventory to maintain the manufactures original specifications as well as protect your warranty. Do you prefer to do your own repair? This location is a collection point for items purchased from our O.E.M. parts web store, GP-PartsDirect.com. Best of all, ground shipping to this location is free! Online information – We know information is important to have readily available which is why we have our client’s service information available on our online client portal. Click here to request access to your service history, open and completed repairs, and more.